Share the post "Evaporation: Closing the Gap between Forest and Urban Water Flows"
Now, the forest mist is an unchecked rain that washes across polluted streets and sidewalks. The urban hardscape of Seattle and surrounding areas interrupts the balanced ecological flow of our pre-development forests and wetlands. We know imbalance creates stress on a system, but how do we regain ecological equilibrium in areas that are now urban? What can we learn from nature that will help our cities thrive? How can we design our buildings and infrastructure to function like the natural ecosystems that preceded them? The Urban Greenprint is a project that asks these questions, applying biomimicry at a city scale. The project looks at issues not only of water flows, but also of carbon flows and biodiversity. The initial focus of the project is Seattle. Perhaps not surprisingly, the most eye-opening research to-date is related to rainfall. In the water-rich region of Puget Sound, the forest holds a critical role of helping regulate water flows. 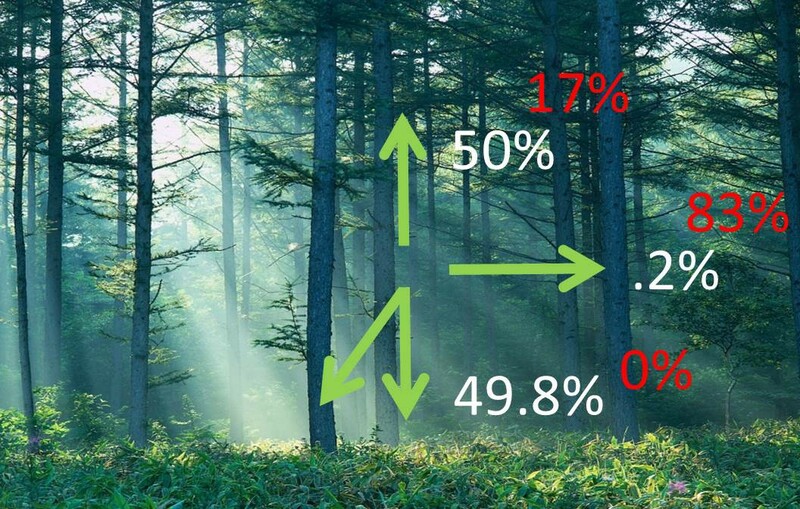 When we study these flows, we learn a very important fact: when it rains on our region’s forests, 50% of that rainfall is “evapotranspirated” — used by the plants and then returned to the atmosphere. This is important. For Seattle, as for many cities across the globe, polluted runoff is an enormous problem — considered by many to be our most critical environmental issue. The rainwater that washes across polluted roads and sidewalks flushes toxins into water bodies. What our research tells us is that if we can design our cities to evaporate half of the rainfall, as our local forests do, we will go a long way towards solving our polluted runoff problem. 50% of that rainfall is “evapotranspirated” — used by the plants and then returned to the atmosphere. This is important. Regulators and the building industry are putting forth tremendous effort to slow and filter water, but evaporation is rarely, if ever, emphasized. This is a primary component of our regional water cycle, and it needs to be addressed. The current focus of the Urban Greenprint is to generate building design techniques and use of materials that take cues from our local natural ecosystems, including methods of construction that encourage evaporation. Textures, layers, and permeability all contribute to a system that holds water like a sponge until it infiltrates or evaporates. 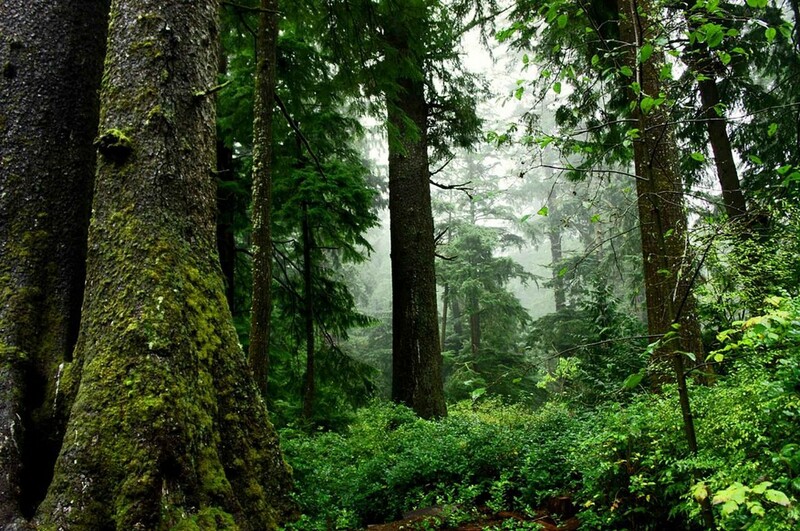 Remember the mist you feel on your face when you walk through a coniferous forest in the rain? The layered and textured canopies of red cedars and other conifers break up big raindrops into fine droplets that readily evaporate. Tree trunks, lichen, and moss hold onto moisture, as does the detritus on the forest floor and the rich organics in the soil itself. Textures, layers, and permeability all contribute to a system that holds water like a sponge until it infiltrates or evaporates. What if rainwater, after being used inside a building, gravity-fed out to a spongy façade where it was held until it evaporated? What if building skins had hydrophilic and hydrophobic surfaces, like moss, to hold onto water and slowly trickle it off the building, increasing the opportunity for evaporation? What if curbs were built of material mimicking mushrooms to remediate stormwater and store it until it could evaporate? What if downspouts coming off our buildings were designed to pool water in staggered trays along their height, allowing for evaporation, like the leaves of a tree? The Urban Greenprint is exploring these and other ideas through community engagement and workshops with design and material experts, and we are eager to expand the conversation to include you. What other ideas come to mind when you think about ways that nature evaporates? How could these strategies from nature be mimicked in our construction practices? How can we transform the way we look at buildings, how we design and construct them, and how we interact with them? Please share your ideas with us! Jennifer Barnes is an architect and sustainability consultant with over 20 years of project experience. She splits her professional life between her own sustainability consulting company, 55–5 Consulting, and her work on the Urban Greenprint, a project that applies biomimicry at a city scale. Jennifer is a co-founder of Biomimicry Puget Sound and is very active in the Northwest green building community. She speaks frequently at conferences on various sustainability topics including deep green construction, biomimicry, and water issues. Jennifer has a BA in Architecture from Princeton University and a Masters of Architecture from the University of Washington. Alexandra Ramsden leads Rushing’s sustainability consulting practice and is the cofounder of Biomimicry Puget Sound. At Rushing, she guides teams to identify project appropriate sustainability solutions for both buildings and businesses, and develops green building educational programs. Alexandra’s passion for reconnecting people to nature inspired her to found and develop Biomimicry Puget Sound, a local network of biomimicry enthusiasts gathering to foster change in policy and design through the perspective of nature. Alexandra is also an instructor for the Sustainable Building Advisor Program (SBA), teaches Green Operations & Maintenance, and lectures on Integrated Design, Biomimicry, Living Building Challenge, and LEED. Reprinted via AskingNature – the Biomimicry Institute and Global Biomimicry Network blog. Posted on August 14, 2015 at 3:33 pm.